"Whats a nice girl like you doing in an alley like that!" 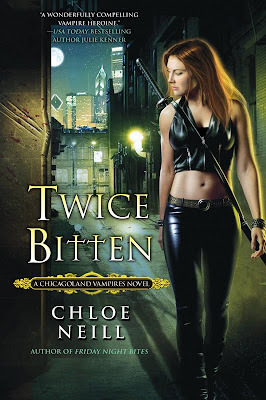 Chloe Neill revealed the cover for her third Chicagoland Vampires novel Twice Bitten today. Release is set for July 6, 2010. Friday Night Bites (Book 2) hit the shelves earlier this month. Merit has definitely upgraded her wardrobe. Rowr. I really like this cover, it has more of an urban fantasy feel then the past two covers in the Chicagoland Vampires series. OK, twist me arm - I don't think the model looks anything like the character on the first two. Although it's still a nice cover. 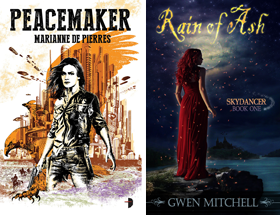 Boy I am cranky today with covers. Stacy it is certainly eye-catching. Donna a number of covers are using the city streetscape /alley look and I quite like it. A smart choice. KMont as always its probably a question of truth in advertising. Is the cover upgraded just to attract more readers eyes or does Merit ACTUALLY change in this coming book. Is this an honest representation of Merit?